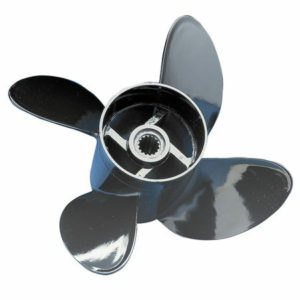 Why Choose a Comprop Boat Propeller? The COMPROP was introduced over 25 years ago as a three-blade design intended as an inexpensive “get-home” spare wheel. 15 years ago COMPROP was redesigned as a primary-use, four-blade propeller, and it will be offered by Regal, Wellcraft and Corona as the original-equipment propeller on a limited number of new boats. One such boat is the Regal 202SE. To see how the COMPROP stacks up against the aluminum alternative offered by Regal on this boat, we headed to the boat-builder’s test center in Orlando. The COMPROP can handle up to 200hp (outboard or stern drive) aboard boats as big as 21′ and/or 3,000 pounds. Our 19’10″ bowrider test boat, with its 180-hp MerCruiser 4.3LX V-6 engine and an Alpha One outdrive, fit those parameters easily. COMPROP has a 13 1/2″ diameter, and it’s offered with 18″, 20″ and 22″ pitch. Composite Marine Propellers, which manufactures the COMPROP, says changing from three blades to four smaller blades spreads the load out over more area, eliminating the excessive blade flexing that hampered the performance of earlier models. CMP says the COMPROP blades now flex about as much as an aluminum prop’s blades. CMP refuses to divulge the exact material used in the prop, other than to say it’s a composite. It’s very light—the 22″ model weighs just 2.5 pounds, compared to 4 pounds for an equivalent aluminum prop. The entire prop is one piece, with splines for the prop shaft molded into the hub. There’s no rubber hub cushion. The alternative offered by Regal on this boat is that long-time favorite, a three-blade Quicksilver aluminum prop with a machined spline insert and a rubber hub. In our test, the aluminum propeller showed the strongest midrange speeds while the COMPROP provided the quickest acceleration—as would be expected of a four-blade prop—and top speed. The cost (or even possibility) of repairs, of course, is determined by the extent of the damage to the propeller. Perhaps the COMPROP’s strongest feature is its price. The 22″-pitch COMPROP lists for $94.95, compared to $140.75 for the Quicksilver aluminum prop.